I’ve always been a huge fan of roasted red peppers especially with hot homemade bread slathered with butter. I’m also a huge lover of soup so I thought why not combine the two with tomatoes and fennel to create this hearty Roasted Red Pepper soup with tomato and fennel. It’s after the snow starts to fall that we get into that ‘warm me up mode’ and have soup on the brain. My favourite soup is a bean-filled tomato minestrone but I also love simple broth soups or quick and easy soup like this roasted red pepper soup. Two summers ago we used to grow peppers in our back yard but we have since gotten away from growing vegetables in the garden for now because baby and renovations have taken too much of our time. Our garden is however filled with herbs which we love to grow especially basil to pair with all the fresh vegetables that our relatives with massive gardens give us. I also make fresh basil pesto cubes and freeze them for times like today when I’m making a pot of soup and I want to jazz up the flavour. What I love about this roasted red pepper soup is that it takes no time at all to make it. The hard work is opening up the cans of tomatoes and chopping some fennel bulb, phew I know rough. For this recipe I used 2 cups of chicken stock base but you can use homemade if you have it handy. I also used red and yellow canned tomatoes although you don’t need to use the yellow, red is just fine. If you have your own canned tomatoes, even better. I enjoy that bit of sweetness the yellow tomato offers to the soup. How do you make roasted red peppers? Don’t get all in a panic about this because it’s dead easy to do. Roast them on your BBQ>>> here is a step by step recipe to help you out. Roast them in the oven with a bit of olive oil, cover and then peel. For this recipe since I wanted this to be a quick and easy soup I used the roasted red peppers in the jar with a vinegar brine. I simply opened up the jar and sliced the roasted red peppers and put them in the pot. Keep in mind the brine may have some salt in it so you will have to adjust how much salt you add to your soup or you can wash off the peppers of most salt. I use 2 cups of water in this soup as well as 2 small potatoes to add a bit of starch so it’s not too thin. Once the roasted red peppers and fennel are soft which takes about 15 minutes cooking the soup at med-high I whip out the immersion blender and blend it all up in a matter of seconds. Then I take my strainer and strain the pot of soup so the texture is silky and smooth. You also get rid of any tomato or pepper seeds that might have found their way into the pot. I topped off my soup with Romano cheese shavings and a dollop of fresh goat cheese. How’s that for homemade roasted red pepper and tomato fennel soup in a flash! No more canned soup for you. 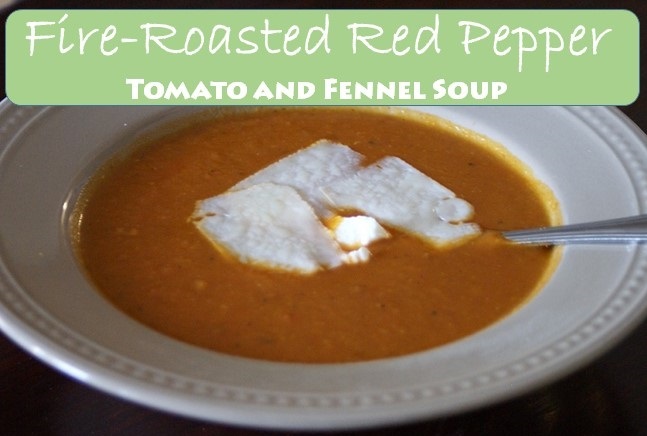 If you enjoy red peppers you will won't waste any time making this roasted red pepper tomato and fennel soup. It takes virtually no time at all and you will have hot soup on the table in a flash. 1 basil cube size of muffin cup-see recipe link or use a handful of fresh basil, parsley, clove of minced garlic instead. Note: to make this a creamy roasted red pepper soup you can add in one cup of cream at that end. Roasted red pepper soup is one of those soups you might find as a ‘soup of the day’ in a restaurant but don’t be shy to try and make homemade soup at home. Although roasting red peppers and making chicken stock seems time-consuming remember you can always find shortcuts to get food on the table in a flash. You might just be amazed at how simple it can be. Please Subscribe to the blog so you get my daily email and follow me on social media. If you like FREE then click this link for my FREE Excel Budget Spreadsheet and lists. Fire-Roasted Red Pepper Soup with Tomato and Fennel looks so appetizing! My wife wants to cook one of these days. She seems very excited having found out the recipe. I wonder if she can pull it off, there are lots of spices that she needs to prepare. Thanks for the recipe! I look forward to my wife’s preparation. Looks interesting indeed!!! I have turkey stock, home made, in the freezer and I need to make some chicken stock from the bones and other remains I have in the freezer. Might be good to do that when the guys come to replace our furnace to help keep the place warm while they are switching things out down stairs. Something to think about!! !